My Instagram Pic is featured on Runner's World site! Ever have one of those days where you are just full of "Wonder what today has in store for me?" Today was one of THOSE days. 6:02am I popped up out of my bed like I had something to do. Somewhere to go. Ummmm...oh hey, remember me? I don't have a job anymore. It's summer. My kids don't have Volleyball practice until 8:00am. What the heck?? Regardless, I jump up. Start the dishwasher (from last night's dishes), get the laundry going, take the dogs out, brush my teeth, pull my unbrushed hair up in a high bun (those who know me well can appreciate that), run the trash cans out to the road (and my neighbors trash too because they are out of town) and then come back inside to drink my normal three cups of morning coffee. What's on my agenda for the rest of the day? Who knows?? I just had a feeling today was going to be a great day. I even tweeted that I was ready for it. And then I get a message from one of the editors of Runner's World Magazine. A little while later I see the tweet. OMG. Are you kidding me?!?! Seriously?!?! 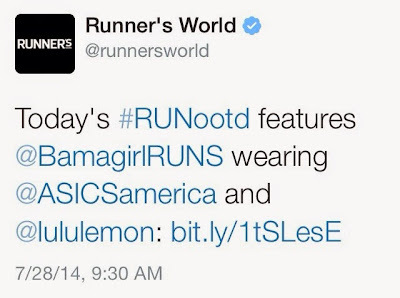 Runner's World just tweeted my name and my pic to 832.5K Followers??? 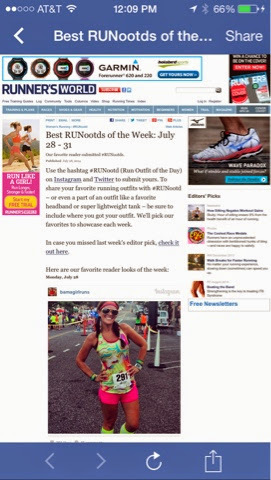 I'm featured on the Runner's World Magazine website for my #RUNootd. (Run Outfit of the day). WOAH. I'm shocked. I'm flattered. I'm so surprised!!! Now, I know to lots of my runner friends and Twitter peeps, this isn't the biggest deal to them. They've been featured. They are sponsored. They work with all kinds of companies and brands. I dabble in that a little bit but to me in my world, and I live in my own small world (see what I did there? ), this is HUGE!! I didn't enter the Team Chocolate Milk Contest because I thought...who would vote for me?? And I certainly did not enter the Runner's World Cover Contest. Same thing. I can't compete! So when, THEY featured ME....WOWZA. I'm truly humbled. I showed my kids. They looked at me like I was from another planet. I texted the article to my hubby...and no response. Womp Womp Womp. #MomGlamFail. Not that they don't care about me, they just don't "get" it. That's OKAY. They don't have to. 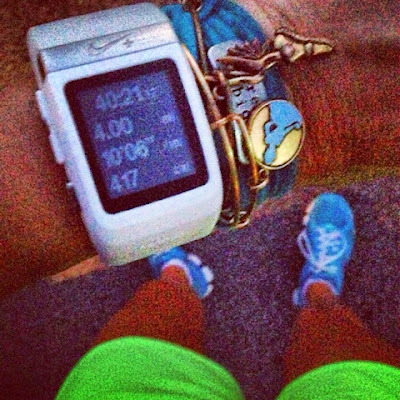 They run with me but ultimately, running is MY thing and I will spend just a few minutes being proud. I wore a cute outfit, themed it just right for my race and I've been featured in America's largest running magazine. Talk about a Happy Monday!!! I've never read my name and Runner's World in the same article before and I really just have to let it soak in for a second. Really. I've had to pull it up o my phone again just to believe it. 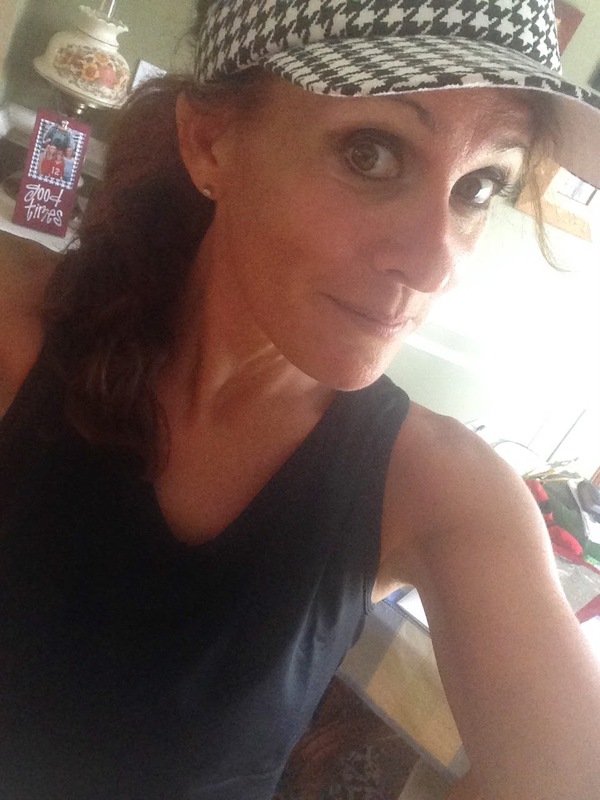 Happy Running and Have a Fabulous Week! 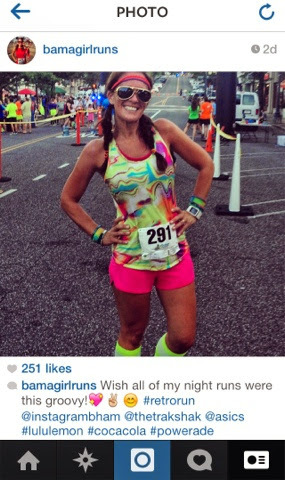 To see more #RUNootd's be sure to visit RunnersWorld.com and check out the editor's picks on how these outfits are functional too! Also, I purchased my Asics tank at Lady Foot Locker using a giftcard that I received from attending a #DisneySportsFestival media event with runDisney and Disney Sports (ESPN Wide World of Sports Complex). 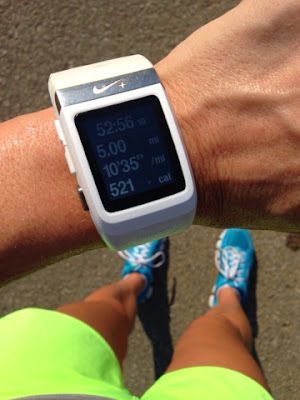 My shorts were purchased at Lululemon and I tracked my run with my Nike+ Sportwatch. My entry to the Retro Run in Birmingham, Al. was sponsored by Coca Cola. All opinions are my own. I was going through my camera roll last night and found this pic. What in the world?? This was taken by my 2nd beautiful child who is always taking the most random pictures. However, it dawned on me...this is what she sees when she looks over at me. ME. She wasn't taking a picture of a perfectly posed pic. Not edited. Not cropped. Not ready-for-Facebook. Authentic and real. ME. I'm at Little Caesar's drive-thru grabbing a few pizzas because I promised them that I wouldn't cook or run tonight----we are catching up on Once Upon A Time, three episode marathon. Whoop! Water in the console. Seatbelt on. 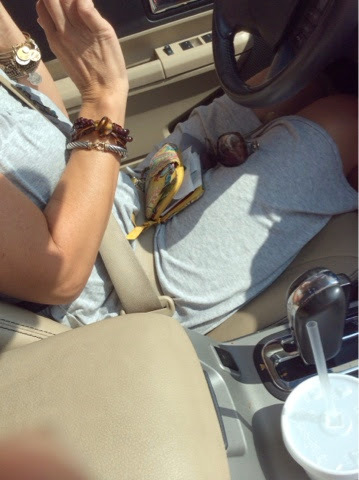 I'm on the phone as we pull up trying to cancel an appointment. My wallet is always always always HOT MESS but I always carry a cute wallet. I've got lots of arm candy. I'm in a cute simple grey t-shirt dress that I got lots of compliments on...cost 3.49 at Gap outlet and I never leave home without my sunglasses. I whip off my sunglasses to talk to the drive thru person. I don't know why I do that but I do. It's important to me that I match up my real life with my online life. Yeah, we all want that perfect Facebook/online life where we are all happy all of the time, all on the most perfect vacation or we all have the most perfect clean home with the most perfect well behaved children. Or do we?!?! I only wish she would have gotten a glimpse of my Alabama curly hair in July. Now that's worth a zillion pictures for Facebook! UPDATE: This contest is now closed and YOU should have entered!! All of my entrants were winners!! Congratulations!! Summer is here and while most people are not thinking about those nasty winter colds right now, it's just as important to keep those summer yucks away too! I want to help you stay healthy and hydrated! Being a runner, I'm constantly in search of ways to stay hydrated. Good ole' fashioned water is my number one choice (Dasani is my fave) but let's face it, I like to mix it up every once in a while. However, I won't sacrifice junk for flavor. One of my solutions?? I reach for Emergen-C! 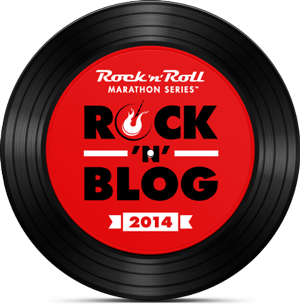 I'm excited to be able to host a two month supply of Emergen-C to all of my blog readers! Emergen-C are individually packaged Vitamin C and Electrolyte Supplements. They are great to throw in your purse, gym bag or to keep in the pantry at home. Each packet of this fizzy drink mix contains more Vitamin C than 10 oranges (plus electrolytes & antioxidants)! WOW. I don't know about you, but I don't really remember the last time that I ate 10 oranges in one day. Seriously, that's good stuff! The super-charged Emergen-C Immune+® dietary supplement supports your immune system with the key nutrients your body needs, plus a propriety complex with beta-glucans and arabinogalactans. Emergen-C Kidz vitamin supplement drink mixes offer all of the fun and fizzy goodness of the original Emergen-C, now specially formulated just for kids! For each box sold, 25¢ is donated to Vitamin Angels®, to provide lifesaving vitamins to one child for one year. Plus each packet provides a whopping 250 mg of vitamin C, antioxidants, B vitamins, and electrolytes – to keep your kids feeling good every day. Helping you stay healthy is our… well… specialty! Emergen-C specialty formulas contain targeted nutrients to support specific health needs. With so many different natural flavor varieties, you can find a flavor that is just right for you! 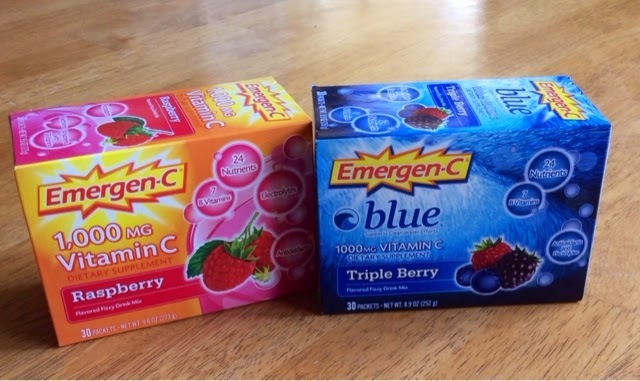 Prize includes 2 Boxes (30ct each) of Emergen-C. (Raspberry and Triple Berry). Giveaway ends on Friday, July 31st! Make Healthy Contagious! Be sure to visit emergenc.com/share to request a FREE sample of Emergen-C to send to a friend, family member or coworker! Happy Running, Good Luck and Have a Healthy Day! *Disclaimer: I have been provided samples of Emergen-C because I am an Emergen-C Ambassador! I am providing feedback based on my own opinions, giveaways and reviews of this product. All thoughts are my own. Look what I'm trying out today! I've heard the all the rage over the last year or so about the company called EnergyBits. 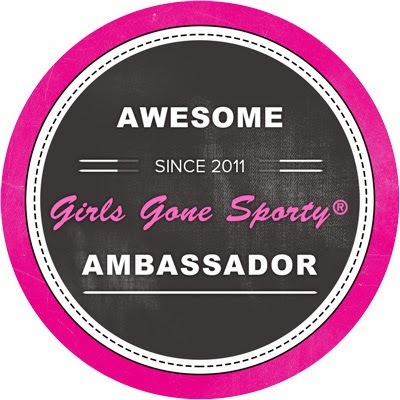 Lots of my runner friends swear by them, say they are fantastic and are even ambassadors for the company! I just could not bring myself to try them. Algae??? Oh I just don't know if I could. 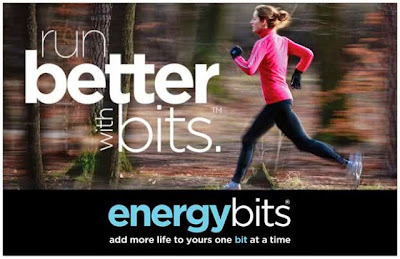 However, I'm a twitter junkie and the @EnergyBits Twitter account is top notch when it comes to being interactive with runners and twitter chats. 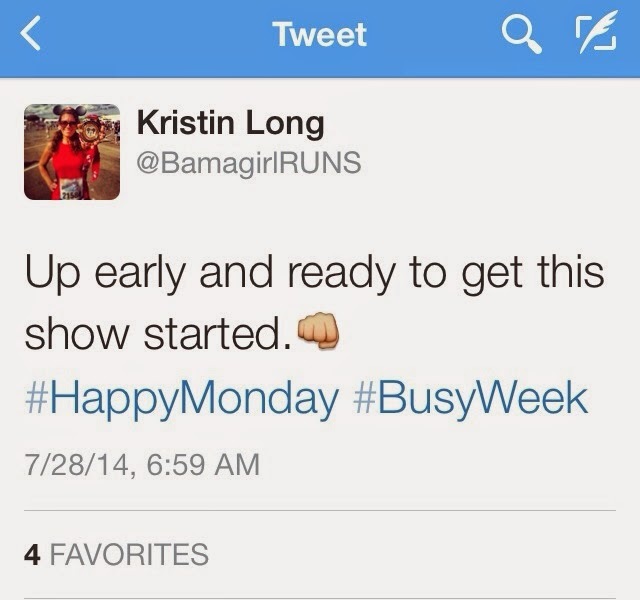 You can most likely find them hosting or participating in #runchat Twitter Chats. 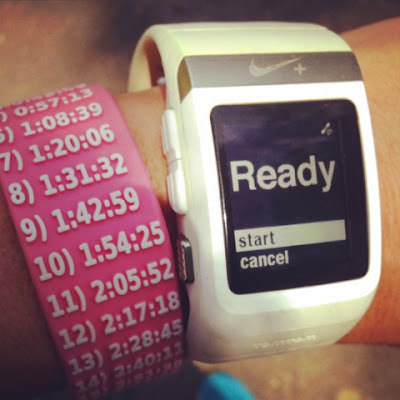 I love companies that REALLY interact with their consumers and for that reason alone, I felt inspired to try these on one of my hot summer runs! Totally worth the hype! ENERGYbits® are tiny algae tabs so nutritionally dense, they eliminate fatigue and hunger instantly. Want a healthy, natural way to fuel your game or fire up your brain? 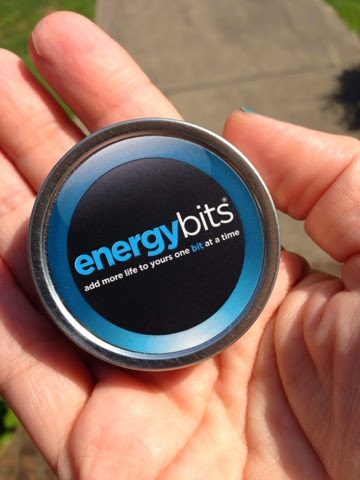 ENERGYbits® are for you! NO caffeine, sugar, chemicals, gluten or soy, just pure, plant based nutrition, all for just ONE calorie per tab. 30 tabs equals 30 calories! 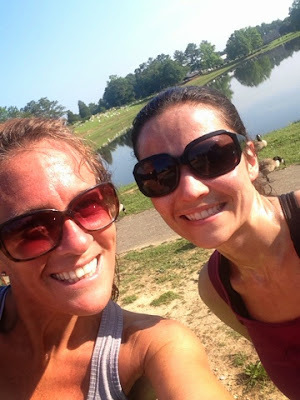 I set out with my friend Holly for a 5 mile run and decided to try out my Energybits. I ate 30 of the little pieces of Algae, chugged with a big glass of water and then hoped for the best! That's only 30 calories...I can handle that! I gave her a sample too and she said she would definitely try them again. After we ran, we both decided that we did not suffer any stomach issues, nausea or side effects from these tablets. We only felt the positive results....Success! Me and one of my BRF's Holly! I have to say that I really did feel energized throughout my entire 5 mile run. The first two miles were pretty much like normal (the hardest two miles) but I did not find myself wondering when I was going to be done. 5 Mile run at a great pace...never felt tired! Usually by the end of my run, I'm ready to be done! After trying these, I felt like I could go 5 more miles no problem! There is an unusual taste with them but I won't say that it was bad--just unusual. Just like everything else, once you get used to it, you won't even think twice about it. I remember back in the day when I first started using energy gels, I could hardly get those down. They are SO sweet, so thick and some just do not taste good!! These algae supplements are healthy and natural. I'm a HUGE fan of that! I will definitely not hesitate to try Energybits again! Next time, I want to test them out on a longer run...maybe 15 or 20 miler! That's when I will need some serious energy!! Algae was the first plant life on earth almost 3 billion years ago and is considered a superfood because it contains virtually every nutrient. It has over 60% protein content, over forty vitamins and minerals and a more complete amino acid profile than beef or soy beans. It is also one of the best known food sources of beta carotene, B vitamins, antioxidants and chlorophyll. Spirulina algae is a cultivated algae which has been consumed for thousands of years by the indigenous peoples in Mexico and Africa. It has the highest concentration of protein earth - triple that of steak as well as the second highest concentration of an Essential Fatty Acid called GLA (second only to mother's milk). Its nutrient profile is so similar to mothers milk, it is considered a "perfect food." Chlorella algae is harvested in fresh water tanks and has been used for over fifty years in Asia. It has a remarkable ability to help remove toxins and help build the immune system. All naturally. 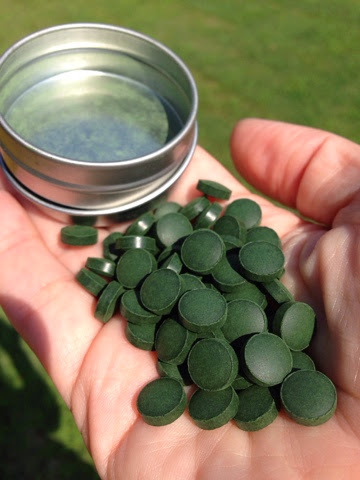 Chlorella contains over 40 nutrients including all the B vitamins, vitamin C, zinc and many minerals. It offers so many benefits we would never have enough room here to list them all. For more information on energybits, vitalitybits, skinnybits and recoverybits, go check out energybits.com. **Have you ever hesitated to try something new on a training run?? Disclaimer: I was given a sample of this product in exchange for my honest review. All opinions are my own. 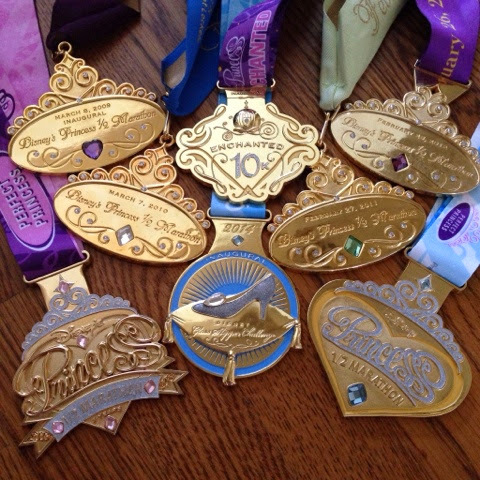 Seven Reasons Why I Will Always Be a #runDisney Princess! Inaugural Princess Half Marathon Finishers! 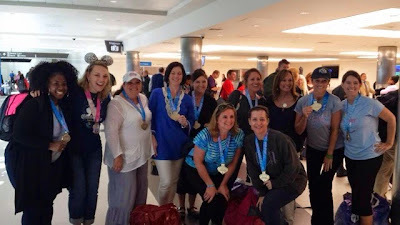 What started over six years ago as a trip to Walt Disney World to run the Inaugural Disney Princess Half Marathon has now become a yearly tradition for me, my mom, my sister and some our best girlfriends. 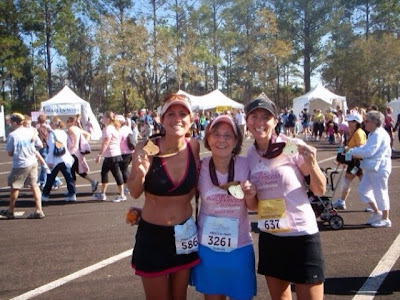 I'm proud to say that four of us have ran every Princess Half Marathon since 2009! We are Perfect Princesses! Last year, we added the Glass Slipper Challenge (Enchanted 10K--6.2 miles on Saturday and Princess Half Marathon--13.1 miles on Sunday) to the weekend runnning agenda and that was fun too! 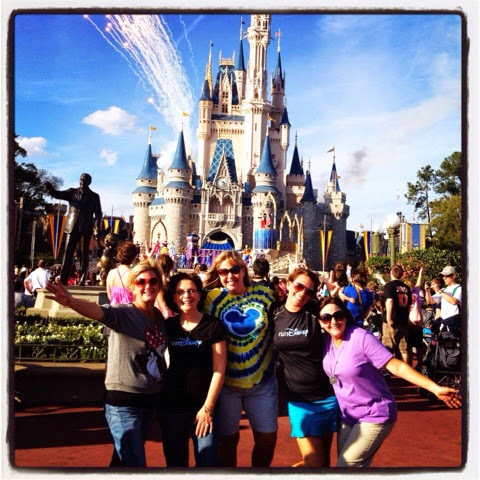 So much fun that I will be registering again this year for the 2015 Glass Slipper Challenge. 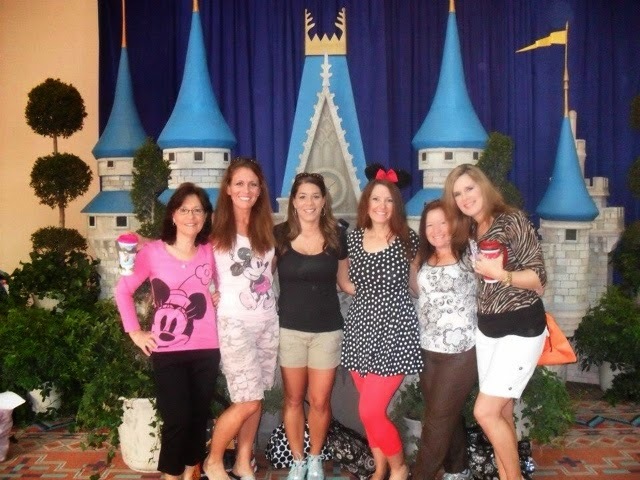 Since 2009, our group of Princesses keeps getting larger and larger. I cannot tell you how much fun I've had hanging out with my best girlfriends and meeting new friends along the way (online and in real life). I've also been motivated to stay in shape and become a better runner knowing that I will always be a Perfect Princess! 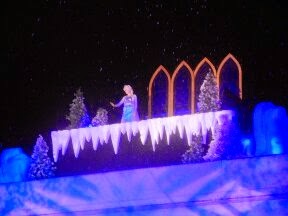 Thanks runDisney! 2009. 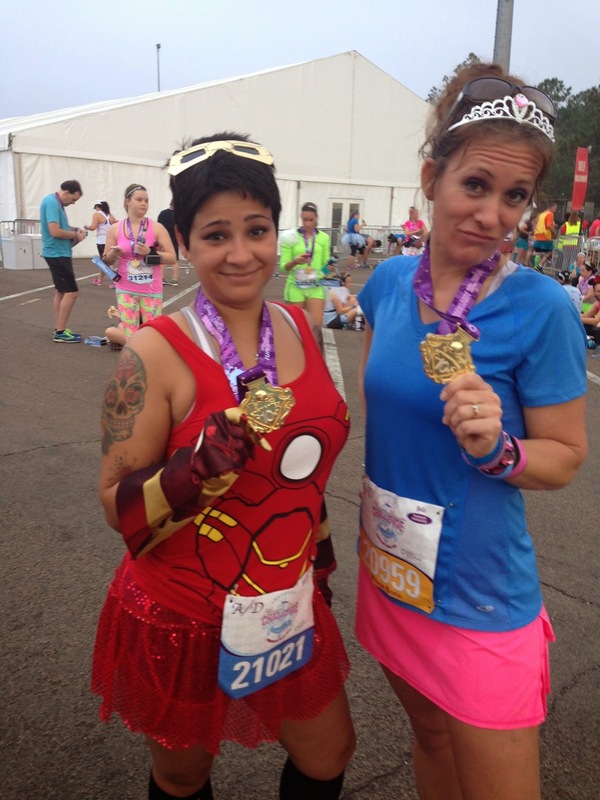 My sister and I ran the Inaugural Princess Half Marathon...Just the two of us! 2010. Meeting some of the Pixie Hollow Fairies with my Princesses! 2011. 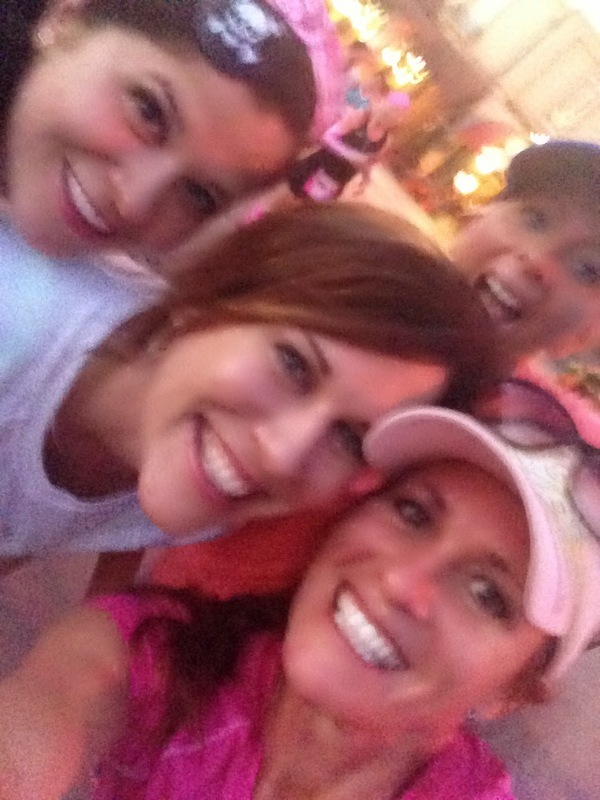 Running with my Princesses through Fantasyland! 2012. Stopped with some of Princesses in front of Cinderella Castle! 2013. Pre-race meetup with my Princesses! 2014. Our group has gotten Huge! Love every single one of these Princesses! We even met new Princess friends in the airport! Hope to see them all again in 2015! 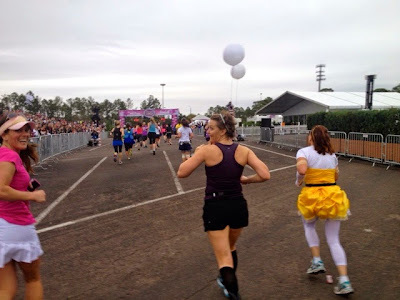 I can hardly believe that I'm about to register for my 7th Disney's Princess Half Marathon! In honor of that, I've come up with 7 lovely reasons why you should register too! 1. 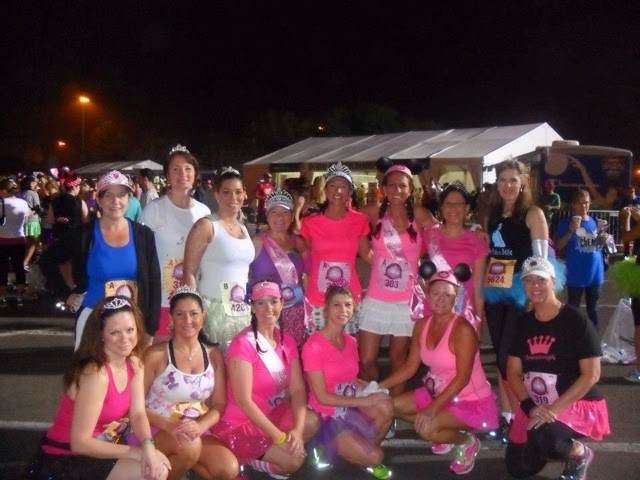 Become a Princess---from the moment we enter the Health and Fitness Expo to the moment we cross that finish line, we are emersed in glitter, tiaras and shiny bling! 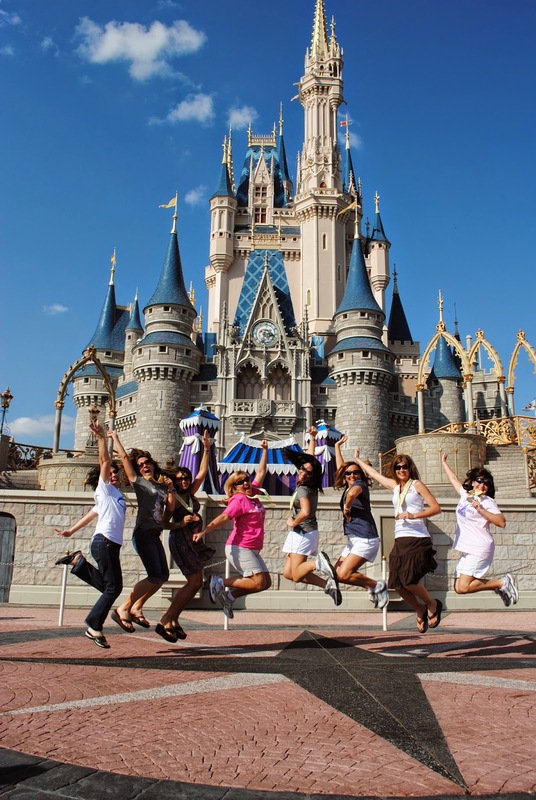 Let's face it, "Mom Life" isn't always glamorous...during Princess Weekend, WE ARE PRINCESSES! Expo fun with Princess Minnie! Shopping, shopping and more shopping at the Expo! The Health and Fitness Expo is truly fit for my group of Princesses! 2. Running is more fun with Princesses---Maybe I should move this to Reason number one. Really, I cannot say it enough. There is nothing more fun than running with all of my girlfriends. It's not just about the running either....we hang out at the parks, eat lots of yummy food and have quality "girl time" during Princess Weekend. These are some of my most precious memories. We just "dropped" into one of our favorite hotels for a visit! Disney's Hollywood Tower of Terror! Our tradition. 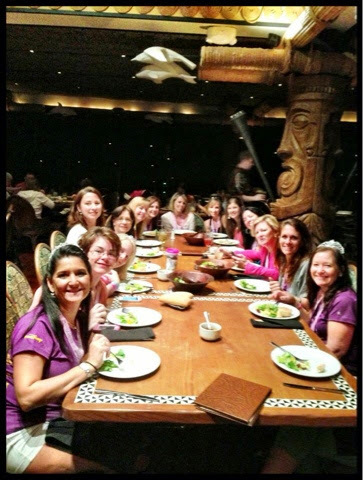 We have dinner at O'hana after every Princess Half Marathon! One day we are going to take up the entire restaurant! Fun Times with my Princesses! 3. Disney---Whether you are running at Walt Disney World, Disneyland and now the newly added 5k on Castaway Cay on Disney Cruise Line, there is no place more magical to get your run on! Every mile IS magic! 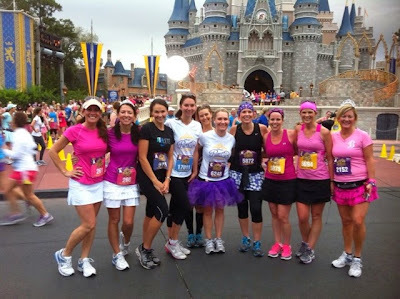 Disney's Princess Half Marathon Weekend.....No laundry, no cooking, no cleaning!!! My Group Selfie Just Got Happier! 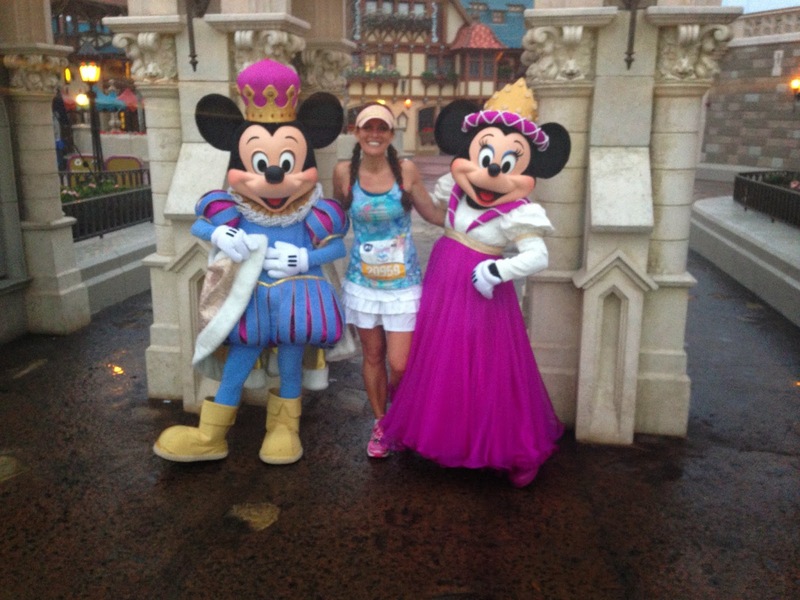 So fun running the Royal Family 5K with Leanne and Aubrey...two of Disney's Social Media's Rockstars! I ran into Steven Miller (one of my favorite Disney Parks Blog authors) before the race. Love that he's out early supporting all of the runners! 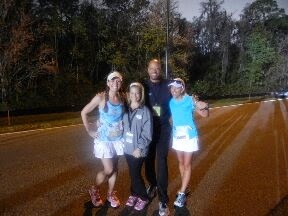 Darrell and Raquel of runDisney and Disney Sports....Thanks for the Team Spirit! See ya at the Finish Line!! We found Pirate Bob Hitchcock! arrrrgggg. Big hugs from the most Charming race announcer EVER, Rudy!! 5. Motivation and Support---the runDisney community is the best in all the 'world'! The online support from friends and family as well as the great volunteers and chEAR squad along the course is just amazing!! There is nothing better than receiving high fives (or high fours) from volunteers wearing big Mickey Hands. That never gets old! Even the most magical Baristas on Earth came out to chEAR on me and one of my BRF's @carrieburrows during the Princess Half Marathon. This was one of my favorite moments of the race. No better feeling that running to the Finish Line with thousands of chEARleaders in the grandstands! finding Mickey AND Minnie New Fantasyland! 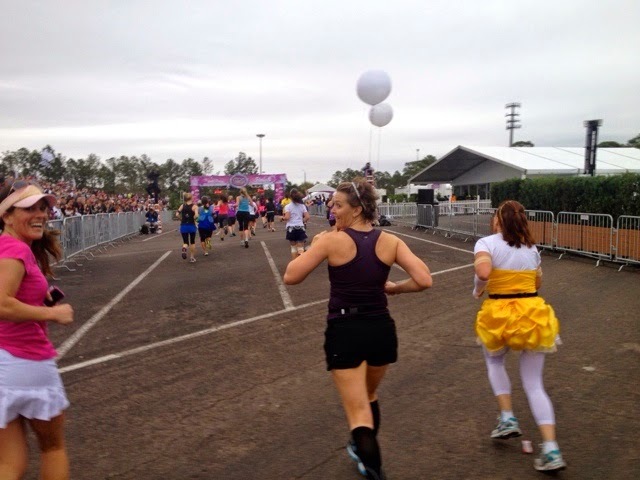 Where else can you cross the finish line and have the Fairy Godmother waiting to congratulate you?!? THIS was my Princess fairytale moment. I love the 5K Rubber Medallion medals too! Some of us need to work on our best Princess-ness. Don't let my tiara fool you, I'm a sporty girl! Photo Shoot after the race with our race medals at my resort, Pop Century! Real Mom Princesses on a Budget. What do you do after you run the Enchanted 10K? Go to Magic Kingdom with your running buddy, of course! In 2015, I will be running Dopey Challenge and Glass Slipper Challenge with my friend Carrie Burrows, follow her blog, CarrieBurrows.com to see more of our adventures and receive great tips on how to incorporate good nutrition and diet into your training. She's a tough little cookie! On the West Coast, I highly recommend following my friend Jindy over at FlowersCroon.com. 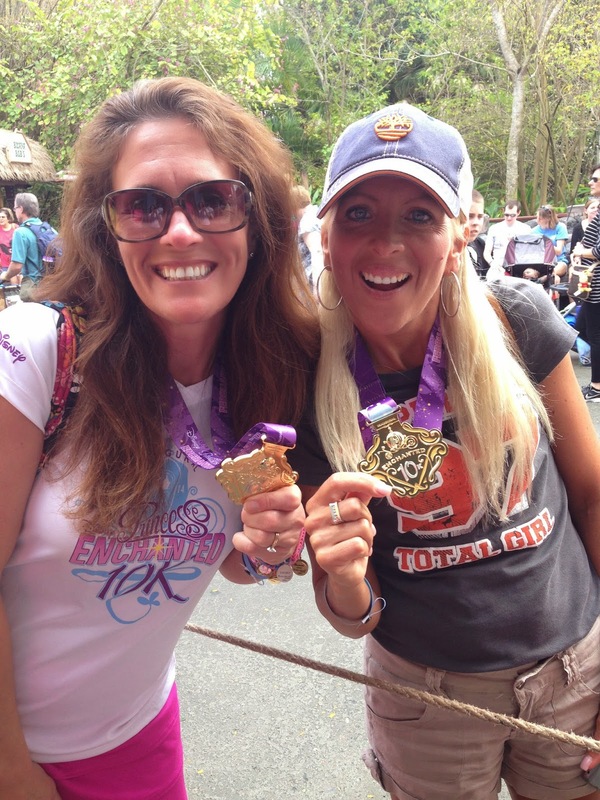 She is a true lover of Disneyland and I love her insight on running the West Coast races and all things California! As for making travel arrangements, my girls Brittney and Susie over at Main Street Memories are just the best. 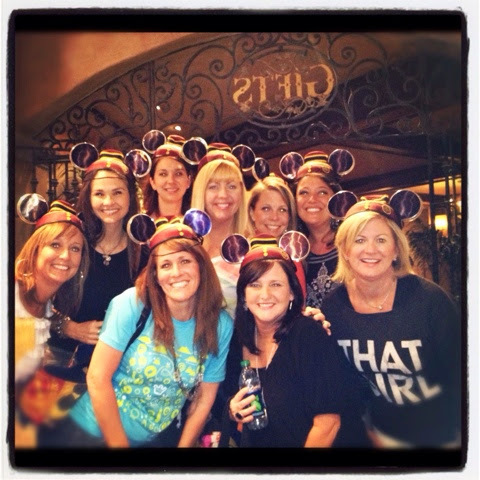 They work really well with large groups and keep me up to date with promotions, discounts and the latest runDisney news. For more information on registering for Disney's Princess Half Marathon and other runDisney events, please visit runDisney.com. 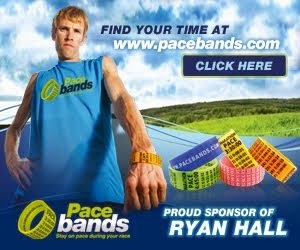 Love keeping us on pace with my new 5 Hour Pacebands! Week 5 of Marathon Training is in the books! Glad that this week is OVER. 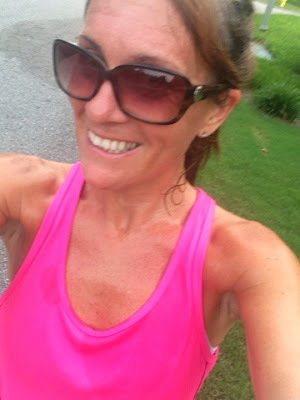 This week has been hot, full of hard runs and Sunday's 9 mile run was NOT pretty AT ALL. Ugh. My hubby hit the wall around mile 5 and I wanted to knock him out!! Good grief. I am trying very hard to be patient with him and overall I think I'm doing pretty good but it's much harder to hit someone else's wall than your own. This marathon training is so completely different for me as I am keeping someone else's pace, running when it's convenient for him and being the encourager. I am the Coach and I am being tested. I'm not sure that I'm doing such a great job passing the test but I'm trying. Regardless, we got the miles and in and I'm ready to move on to next week. I mentioned a few weeks ago that I am now a KatieKActive Ambassador. I couldn't be more excited! I did a little bit of research about this company and I'm very impressed. There are lots of running clothes brands out there. Probably too many if the truth be known. It can be very overwhelming to decide just exactly what works for you. In saying all of this, curves are not necessarily a bad thing but it is hard to find clothes that REALLY flatter your curves. Some fitness clothes just don't look good on certain sizes. Sad but true. One of the BEST features of this company is that their clothes come in sizes 3-3XL. I think this is exciting for women who really want to purchase quality clothes that really look good on them. Let's face it, if you look good you feel good. Katie K Active workout gear is very curve-flattering and is meant to be worn during your workout and then after your workout as well. Amen to that! I know that I will go get a run in and then head straight to the grocery store. I almost always throw on some sort of "cover up" when I go out in public after a good workout. I love the idea of having something that duals as workout or post-workout clothing. Don't think I have a modeling career ahead of me. LOL. 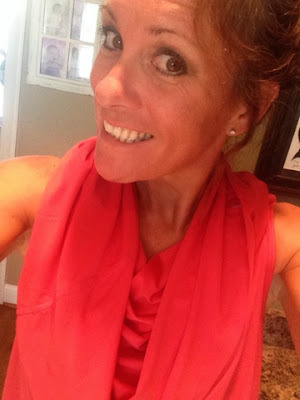 I am the proud owner of the Signature Cowl Neck, Signature Capris (Zebra Print), Headband (Zebra Print to match my capris) and the Racer Back Tank. 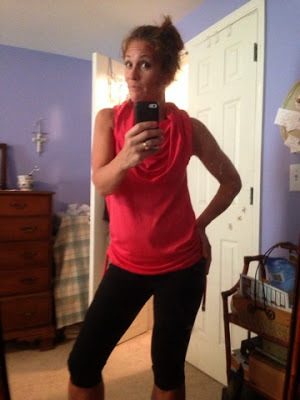 I chose the Cowl Neck in Coral (love that color) and have enjoyed being able to throw it on after I run. 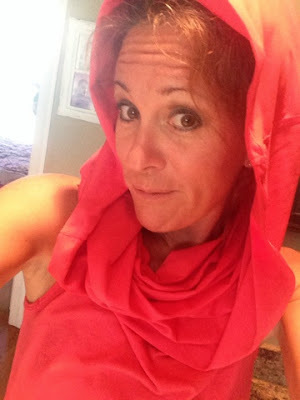 This top can be worn a couple of different ways....with a built in scarf (which I LOVE because I freeze after I cool down), as a cowl neck (haven't tried it that way yet) or as a hoodie, how fun is THAT??? The bottom of this top can be cinched up by a draw-string or left loose. So many fun options. Trying out the built-in scarf feature. Super cute! The Capris are great. They are really really tight. #CompressionLove. There is a reflector strip on the bottom and they have a built-in pocket on the side (perfect for your ID, key, money, etc.). The ones that I chose have a fun zebra print waistband with a grip on the inside. Those babies are not moving after I put them on!! Bye Bye sagging capris! See ya. 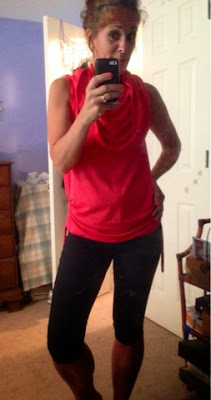 I've worn my racer back tank (I chose black) several times now. One thing that I really get hung up on is how my clothes hold up in the washing machine. If they are cheap material and tear up easily, I don't buy that brand anymore. As much as I would like to think that I will take "extra special care" with washing my clothes, I don't. I have kids and I'm just doing good most days to get the laundry DONE much less wash them a certain way. Again, I wish I was THAT Mom but I'm not. I throw it all in the wash and hope for the best!! So far, my tank is surviving my poor washing habits. It looks just as great as the first day that I got it. #Quality. The options don't stop there. There are skirts, capris, tops, jackets and accessories available. 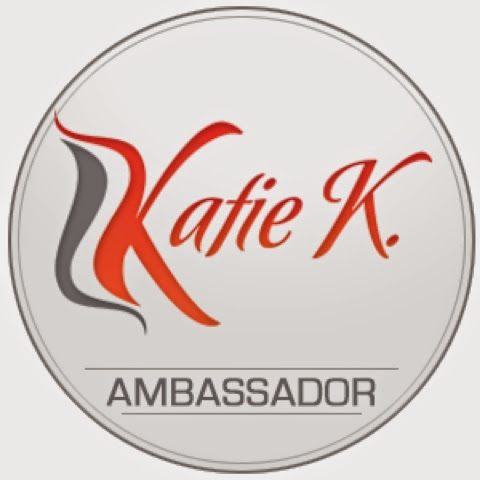 Because I'm an Ambassador for this company, I am able to offer you a 15% discount and free shipping on your next KatieK Active purchase. Go check them out and use Code KRISTIN15. Happy Shopping and I think that you will love these new clothes as much as I do! Let me know if you try out this new fitness wear...I'd love to hear what you buy! Be sure to follow KatieKActive and #DefineBrave on Twitter, Facebook and Instagram for more fun updates on new products and sales!